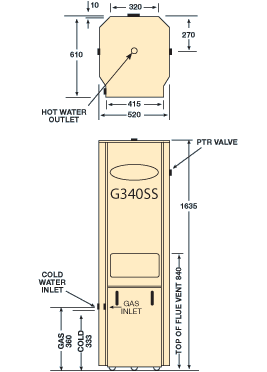 The Aquamax 340 (G340SS), five star energy rated water heater has all the features of the G340SS, with the exception of the mixing valve. This Hot Water System is suitable for new homes. Specifically designed for installation where an approved tempering valve is to be fitted to prevent scalding. Your plumber will fit an approved tempering valve on the hot water line, restricting water to a maximum of 50°C (in this type of installation, the mixing valve is of no additional benefit).